One look at the list of cakes I’ve posted so far and you will see that chocolate cakes are not very popular around here (and we’re talking almost 5 years of blogging, people); lemon (surprise! ), apple and banana are the usual suspects. But the photo of this cake on Rose's book made me really curious about it: the shiny, dark glaze looked so beautiful. Almost supernatural. I had to make it myself. Preheat the oven to 180°C/350°F. Generously butter a 10-cup capacity Bundt pan. In a medium bowl, whisk together the sour cream, cocoa, eggs and vanilla – mixture will be lumpy. Set aside. In the large bowl of an electric mixer fitted with the paddle attachment, mix the almond flour, all purpose flour, sugar, baking powder, baking soda and salt on low speed for about 30 seconds. Add the butter and the cocoa mixture and mix on low speed until the dry ingredients are moistened. Raise the speed to medium and beat for 1 ½ minutes. Scrape the side of the bowl then beat for another 30 seconds. Transfer the batter to the prepared pan and smooth the surface. 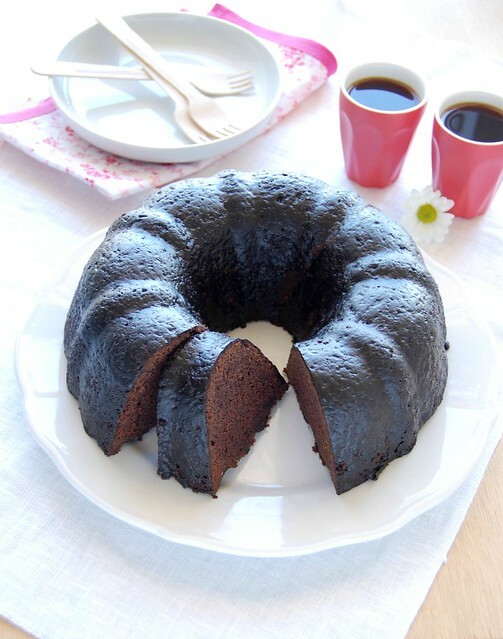 Bake for 50-60 minutes or until a wooden toothpick inserted in the center of the cake comes out clean. Make the cocoa syrup shortly before the cake is finished baking: in a small saucepan, whisk together the cocoa and sugar. Add a small amount of the boiling water, whisking until all of the mixture is moistened. Add the remaining water, whisk, and then bring the mixture to a boil over low heat, stirring often. Remove from the heat and stir in the vanilla. Cool for 5 minutes before using it in the cake. As soon as the cake comes out of the oven, poke it all over with a wooden skewer then pour 1/3 of the cocoa syrup over the cake. Let the cake cool in the pan over a wire rack for 10-15 minutes. Carefully invert the cake onto a plate and brush it with the remaining cocoa syrup. Cool completely before slicing and serving. I love cocoa so much! Your cake looks so delicious. I really want to bake it soon as chocolate is my elder son's favorite. Thank you for sharing the recipe. Can you please check the ingredient list? It seems almond flour is missing. There's no almond flour in the list, but it is included in the direction. Thank you and have a nice week ahead. I am a chocolate cake girl myself so you can bet this is going on my to-try list! It look wonderful! Wonderful cake. The syrup looks easy to do and gives a great finish to the cake. Where do you keep all these adorable dishes and linens stored? You always have the cutest things to plate your food. Love them and the cake well - Heaven is served. Made this yesterday! It was sooo good and came out just perfect. I'd been staring at it for a week wanting to make it and finally got the chance =) So glad i did, it will be a keeper! Thanks so much! Hey, Shannon! That is such great news, thank YOU for letting me know how the recipe turned out - I'm glad you liked the cake! does it really swell this much, can i use a smaller dish? Sa, it does - if you use a smaller dish the batter will probably spill over. Lacy coconut-topped brownies + "Cowboys & Aliens"